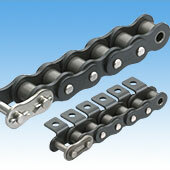 RS Attachment Chain is a conveyor chain with attachments mounted on RS Roller Chain (drive chain) type link plates. Further, the bushes are special oil-impregnated bushes. Provides lube-free, long life operation. Chain pitch is small, making it ideal for conveying small items over small pitches (usually over short distances).